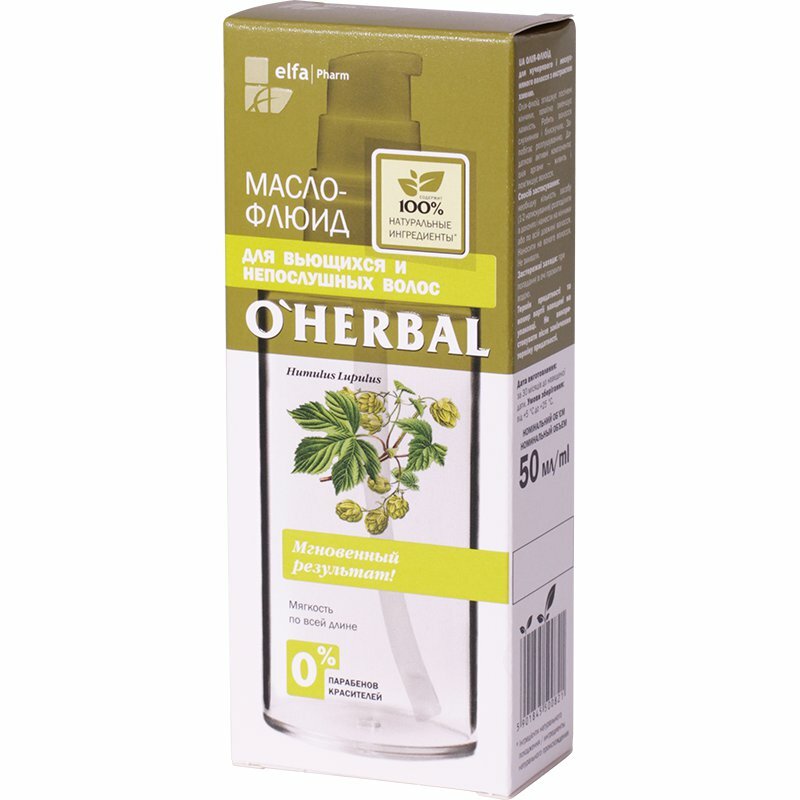 Fluid for Curly and Unruly Hair with Hops Extract is produced by the Polish/Ukrainian beauty brand O'Herbal. The product is formulated with 100% natural ingredients. This conditioner fluid effectively smooths split hair ends and protects your hair during blow-drying and hot styling. It noticeably reduces hair brittleness, makes your hair curls tame, soft and silky, prevents frizzy hair. Instant effect. This O'Herbal hair fluid contains hops extract. It stimulates cell metabolism in the scalp, strengthens hair follicles and prevents hair loss. Hops extract also helps to normalise sebum secretion and the hydro-lipid balance of the scalp. It improves hair structure along its entire length. The effect of hops extract contained in the fluid is complemented and enhanced by argan oil. Argan oil is considered one of the most valuable cosmetic oils. It nourishes and moisturises your hair and scalp, strengthens hair follicles, reduces hair loss and stimulates hair growth. Argan oil also makes combing and styling easier, prevents brittle hair and split ends. Directions. Apply 1 to 2 pumps on towel-dried hair ends or along the entire hair length. Do not rinse. Ingredients. Cyclopentasiloxane, Dimethiconol, Phenyl Trimethicone, Bis-Cetearyl Amodimethicone, Argania Spinosa Kernel Oil*, Glycerin*, Aqua, Humulus Lupulus Cone Extract*, Parfum. Want to buy Fluid for Curly and Unruly Hair with Hops Extract? Call us or submit your order via our web site! O'Herbal is a series of natural hair care products. The brand is owned by the Ukrainian-Polish group of companies Elfa Pharm. All O'Herbal products are manufactured in Poland which means that they have European quality certificates. The philosophy of the brand is very simple. Get closer to nature! High-quality hair care products branded as O'Herbal are formulated with the best and purest natural ingredients such as herbal extracts, vegetable oils and essential oils. All ingredients are bought from reliable suppliers and quality certified. O'Herbal cosmetics are based on modern formulas and produced at a pharmaceutical plant equipped with the latest technology. They are noted for the high content of active ingredients. The use of standardised mono extracts allows to create shampoos and conditioners that effectively care for the hair and scalp. O'Herbal products are completely safe because of the company's strict quality management. The development of innovative formulas and use of high-quality ingredients allows to create unique products that take good care of your hair, making it look healthy and beautiful.